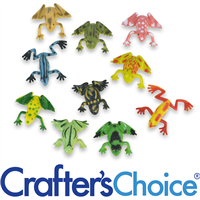 Crafter’s Choice Toys are intended to be used to embellish bars of soap. These toys come in Gingerbread Men, Gold Fish, Snakes, and Turtles. Use to decorate soaps for kids! These Alien Vinyl Toys are out of this world! 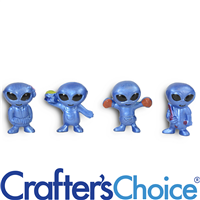 They are mini blue aliens, each with its own flare, that make a great addition on soaps, inside bath fizzies and much more! Embed these awesome aliens in galaxy themed or kids products! 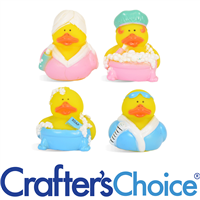 By embedding these Bath Tub Duck Toys into soaps, children will look forward to bath time. Then, when the soap is gone, use as a bath toy! Each Duck has colorful bath time attire and is ready to scrub-a-dub! 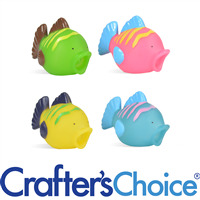 These colorful fish toys are the perfect addition to any kids line! These fun toys squirt water and pair perfectly with a bubble bath. Add to your handmade soaps, bath fizzies and more. Decorate handmade soaps with Birthday Duck Toys and pass them out in treat bags at birthday parties! Each duck wears a colorful party hat and holds a fun party favor. 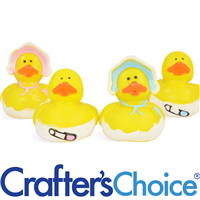 Rubber Duck Soaps are great for kids of any age. Dimensions: Approximately 2" x 2". 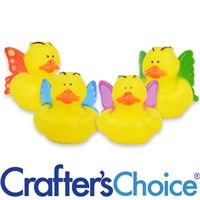 These butterfly duck toys are a great addition to your kids product line! Embed in soap for the perfect gift or add to a gift bag/party favor bag as a toy! 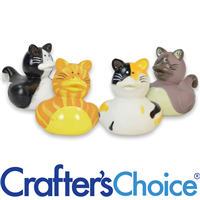 Dimension: Approximately 2" x 2"
These adorable cat shaped rubber duck toys will have your animal lovers coming back for more! Embed into your soap or add to gift bags for the perfect gift! Dimensions: Approximately 2" x 2.75"
Christmas Elf Ducks are little yellow duckies wearing a green and red elf costume with a silly pointed hat! 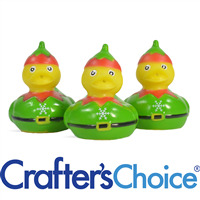 Use Christmas Elf Duck Toys to embellish your Christmas soaps and bath fizzies! These ducks also make great stocking stuffers. 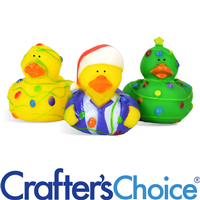 These fun Christmas Tree Lights Ducks are a great way to embellish your holiday soaps and bath fizzies. These ducks also make great stocking stuffers! 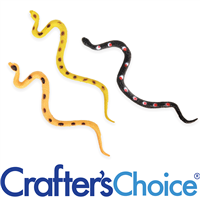 Add these adorable dog duck toys to your product line for all your animal lovers! 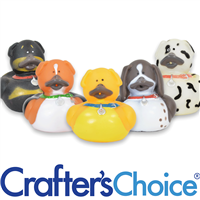 These dog duck toys can be embedded in soap or added to gift bags for an extra special touch! 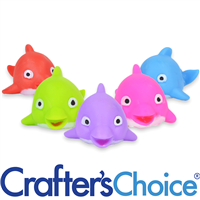 These colorful dolphin toys are a great addition to your kids line. Add these vinyl dolphin toys to your soaps or add to gift bags for the perfect gift! 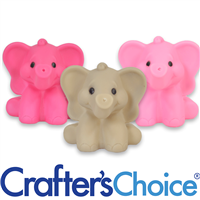 These adorable elephant toys are perfect for baby showers, kid birthday parties or as a gift for any animal lover! Embed the toy into soap or add to gift bags! 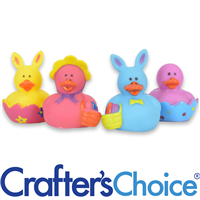 Add these floating duck toys to your kids product line to keep customers coming back for more! 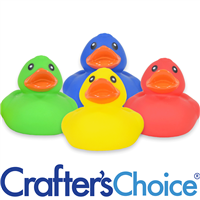 Kids will love splashing around with these colorful duck toys! 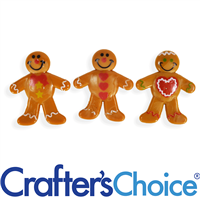 These mini vinyl gingerbread men toys are perfect to embed in your holiday soaps. Use the soaps as stocking stuffers or add the toys to gift sets. Try with our snow globe soap recipe! Your Holiday and Christmas Soaps are going to be a hit! Dimensions: Approximately 1 3/8 x 1 5/8 inch. 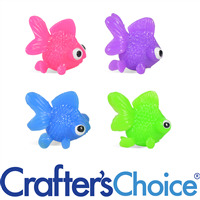 These adorable, bright colorful big-eyed rubber fish are great to embed into your favorite soaps. Add to sparkly blue soaps to create an underwater-effect! Graduates of all ages will love these graduation owl toys! Embed in soap with the graduate's school colors for the perfect gift or party favors. Dimensions: Approximately 1.75" x 1.75"
These Holiday Duck Toys are disguised as Santa, Santa’s reindeer and snowmen! Fun when embedded in soap or added to gift sets and are perfect during the holiday season. Rubber Duck Soaps are great gifts and stocking stuffers. 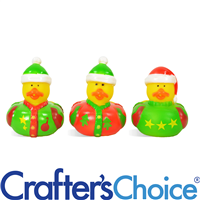 Holiday Sweater Duck Toys are a fun way to add holiday flare to your product line this holiday season. 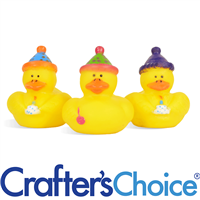 Each classic yellow duck has a fun seasonal twist - red and green sweaters and winter hats! Great for kids soaps and stocking stuffers. Mini Baseball Ducks are tiny rubber ducks with a painted baseball chest! 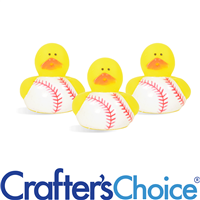 These ducks are great to embed and embellish soaps for your favorite baseball/softball team! Pair with a bubblegum or caramel corn fragrance oil for a nostalgic experience. 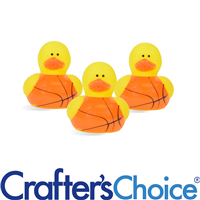 Dimensions: Approximately 1..5" x 1.5"
Our Mini Basketball Duck Toys are perfect for the basketball lover in your life! 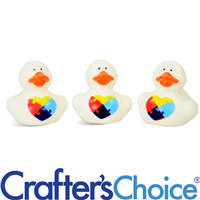 These mini ducks can be embedded in bath fizzies or on top of soap for kids who love the game! Each mini yellow duck has a basketball chest and tail. 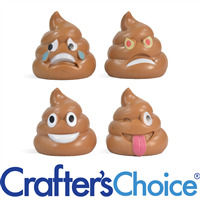 These silly poop characters are great for kids gifts or gag gifts. These mini emoji poop toys are a great addition to soaps, bath fizzies and treat bags! Touchdown! 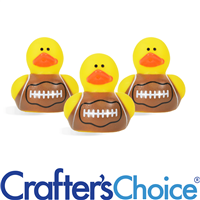 These Mini Football Duck Toys are sure to score at kids birthday parties or football team fundraisers! Each ducky has a football painted across its chest and tail. Place these ducks on top of green soaps scented with Our Fresh Cut Grass Fragrance Oil for the ultimate Friday night lights feel. 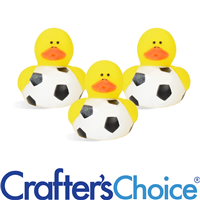 These Mini Soccer Duck Toys will score a goal with kids on soaps and bath fizzies! These tiny yellow ducks have a soccer ball painted across their chest and are perfect for birthday parties, kids crafts and more! These cute owl toys would be a great addition to soap, bath fizzies and gift bags! Ho! Ho! Ho! Santa’s Reindeer have never looked cuter. 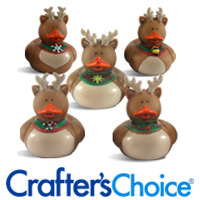 These Reindeer Rubber Duck toys add extra holiday flare to soaps and gift baskets! 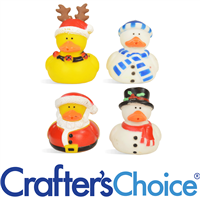 Kids will love these rubber duck soaps as a holiday gift. Snowman Duck Toys are White Rubber Ducks that look just like real snowmen! The ducks have coal for eyes, mouths and buttons, and wear a top hat and a red scarf! 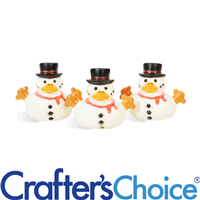 These snowmen ducks are great to add to your winter product line! 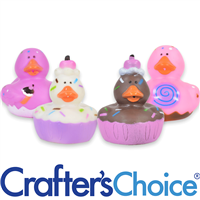 Make your product extra sweet with these sweet treats duck toys! 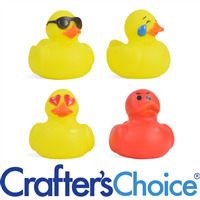 Great for any kids party; embed these duck toys into soap or add to gift bags! Dimenions: Approximately 2" x 2.5"